Web Werks Data Centers Review 2019: Is Web Werks Data Centers a Good Hosting? Web Werks Data Centers is a premier hosting company that operates Tier III and Tier IV data centers with 99.9% SLA uptime. The company offers standard hosting and dedicated servers along with software and e-commerce solutions to customers in 23 countries. 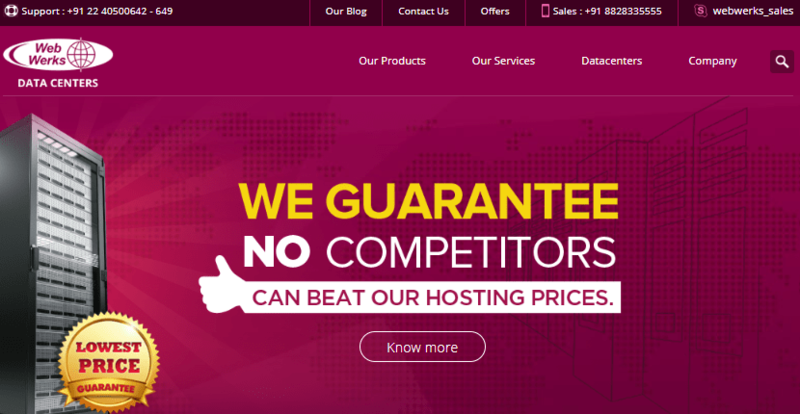 Web Werks is an Indian hosting company that was founded in 1996 and is one of India’s top IT and hosting solutions provider. They offer a range of solutions such as VPS, dedicated hosting, and Cloud solutions. With data centers in the USA and India, the company serves over 5,000 clients around the world. One thing that I like about Web Werks Data Centers is that you can fine-tune servers to deliver optimal performance. Their uptime is good thanks to redundant networks and reliable data centers. Cisco-layered, their dedicated servers provide reasonable security against potential threats. Periodic backups ensure business continuity. You can recover data quickly in the event of a disaster. Additional services include O/S design and implementation, performance management, service monitoring, and IAAS setup guidance. With their VPS hosting, you have full control over your web space at a fraction of the cost of dedicated servers. This is a good option for any business that is growing rapidly and requires scalable resources including on-demand CPUs. Three plans with incremental features are available; Basic VPS, Standard VPS, and Advanced VPS. Setup is instant. Within minutes, you can deploy multiple websites or run resource-intensive apps on your server. Cloud hosting is available on RapidV Cloud, Microsoft Azure, and Cloud VPS. With their Public or Private Cloud, you get a range of options. Their servers are located in secure data centers. With flawless server and network uptime, their facility ensures availability for all basic and mission-critical websites and applications. On-demand resources are available. So you can scale up your rapidly growing business in no time. I like the fact that they provide a good number of web hosting administration tools. Using cPanel or Plesk, you should have an easy time navigating the back end and managing your resources. Web Werks Data Centers offers affordable hosting solutions and flexible methods of payments to suit any budget. Thanks to their Pay-as-you-go model, you pay only for the resources that you use. Their lower CapEx also means you will save more without compromising on the quality of services. Setup and deployment are fast and free. I like the fact that they don’t cap resource usage whether you run high usage apps or multiple websites. Web Werks Data Centers has a rapid action support team that provides 24/7 support to customers. They professionally handle installations, server configurations, troubleshooting, security updates, and maintenance. You can reach them on Skype, email, and phone, and live chat. Technical sales reps are also available to answer all your sales-related queries. Web Werks Data Centers offers dedicated VPS servers and Cloud storage solutions that are rich in features and easy to scale to match any workload or resource requirements. Wondering how Web Werks Data Centers stacks up against other Web Hosting companies? Enter any other Web Hosting company and we will give you a side-by-side comparison.